Roy Race, the teenage goal-scoring sensation at Melchester Rovers, and the star of iconic football series Roy of the Rovers, has signed an exclusive boot deal with British sportswear brand Gola. In the following years, the Gola sponsorship of Melchester Rovers would become emblematic of Roy of the Rovers for an entire generation of football-mad fans. 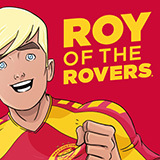 Now Rebellion – publishers of the rebooted Roy of the Rovers – are delighted to be working with Gola once more! Roy will be sporting Gola football boots in illustrated fiction and graphic novels for the rest of the 2018/19 season, and will be seen in his custom boots for the first time on the cover of Roy of the Rovers: Teamwork by Tom Palmer (illustrated fiction, published today!). Roy can also be seen shaking the hand of Gola Chairman Harvey Jacobson on the pitch at Mel Park in the pages of Roy of the Rovers: Foul Play by Rob Williams and Ben Willsher (graphic novel, published 7 March 2019). Having signed a boot deal with the brand, the signature Melchester Rovers colour palette of red, yellow and black has been applied to the Gola Ativo 5 Gamma VX style.